We've The Repair Experts You Need. Call Us Today! Don't know what's causing your garage door troubles? That's okay! Our trained technicians are here to take care of that for you. There is a long list of components that all work together to make your garage door function. If even one of them is a little off kilter, it can make the whole door work poorly. Worse still, continuing to use your door when it's in this state can create even more issues. Don't wait for repairs to pile up to the point of needing a new door altogether! It's not worth it, especially when we can take care of the problem in no time. There are small differences between garage doors in what parts they have. Some have torsion springs, and some have extension. What does that mean for you? Trouble if you get a repair service that only handles extension when you have torsion, or vice versa. Don't risk the frustration! We can repair or replace both types of springs, making sure that your door will be able to open and shut easily. If it's your panels that are busted, don't fret! We also carry all shapes, sizes, and colors of panels so we can suit your replacement perfectly to your door and get it looking like new. It might not be your door at all! A malfunctioning garage door opener can cause just as much of an issue as your garage door itself. Whether it's something as simple as needing to be realigned, or more thorough work such as replacing the motor, we'll be able to do whatever it takes to get the job done. You don't have to be concerned with what make or model it is either. Be it Genie, LiftMaster, or otherwise, you can rest assured that we'll repair it in no time. That's what years of working on garage doors and openers alike gets you: confidence in a job well done. 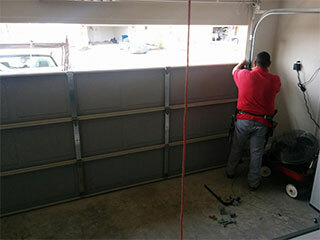 With Garage Door Repair Woodbury, you can be sure that you're getting the best repairs that will be sure to last. Call today, and we'll help you to determine the best time for us to come out and get to work. Your only regret will be not calling sooner! Galvanized or Non-Galvanized Garage Door Parts? When it comes to part repair and replacement, installation, and maintenance, our team of experts is the very best. All the better, they're nearby! This means that they can get down to work faster, and know what solution is best for your home based on your area. Interested? Contact us now! Thank you for choosing our company! Feel free to browse our website for more information in the meantime. Our team at Garage Door Repair Woodbury is at your service any time!